I found a few cute little pumpkins while I was up at Old Mission Peninsula. I put them on my front porch. On the bench I painted this summer. It's kind of cute, don't you think? I used some samples of CeCe Caldwell paint I've had hanging around for a while - Destin Gulf Green (more like a teal) and Alaskan Tundra Green. The bench was old, dirty and oily in spots so it did some funky stuff when I put the paint on it. I love it a little. I was going to sell it, but I'm not sure now. 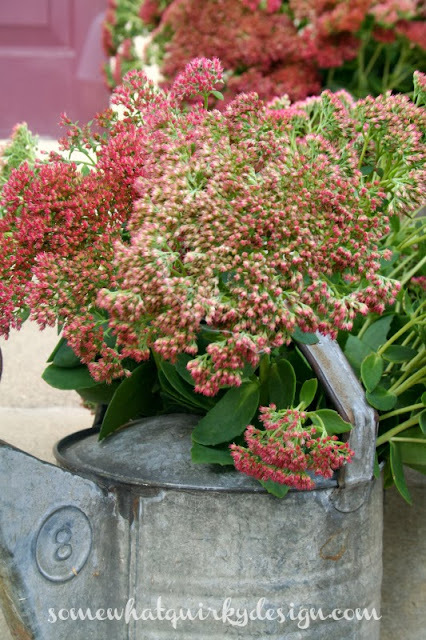 My Autumn Joy Sedum is over two feet tall so it doesn't stand up very well to the rain. The clumps were all laying down from the center out so I just cut it all, put it in some galvanized buckets of water, and put them on the porch. The pine cones were leftover from a Christmas arrangement I had in the window-box two years ago. When I planted the box this summer I pulled them out and threw them on the porch. I knew they would come in handy someday. Someday I'm going to figure out a good time of day to take pictures of my porch. 1. Should I paint a runner up the stairs to the door? The porch is kind of ugly. I think it might be less ugly with a painter runner. 2. 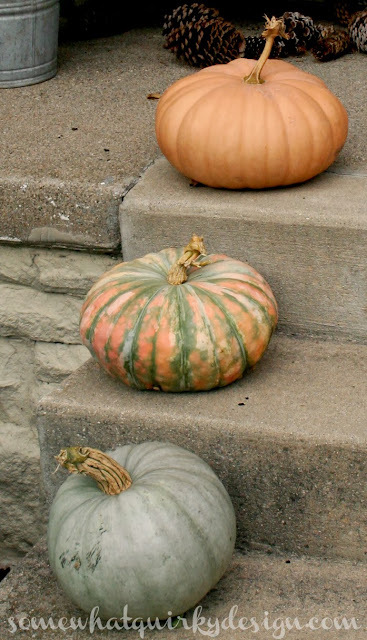 These pumpkins that aren't pumpkin orange - can you eat them? I always cook my pumpkins and use them for soup, etc. 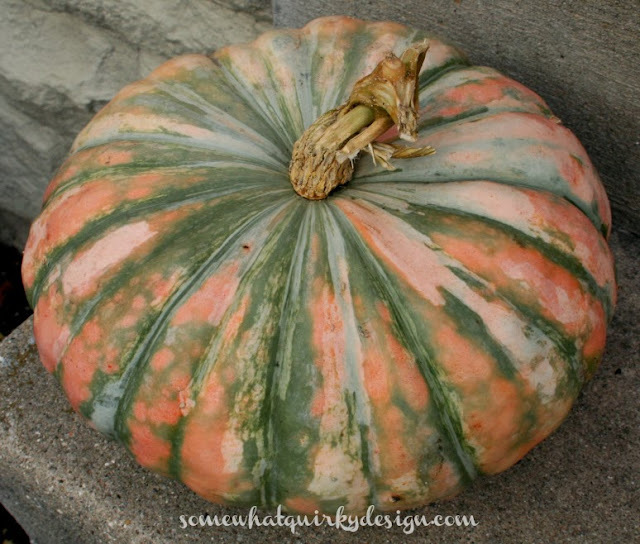 What does a blue pumpkin look like on the inside? Would it make blue soup? These are big problems. I need big help. Tough questions. Not sure about the blue pumpkin question, but a runner up the steps? You might be onto something. I think your porch looks very festive as is. Good job. 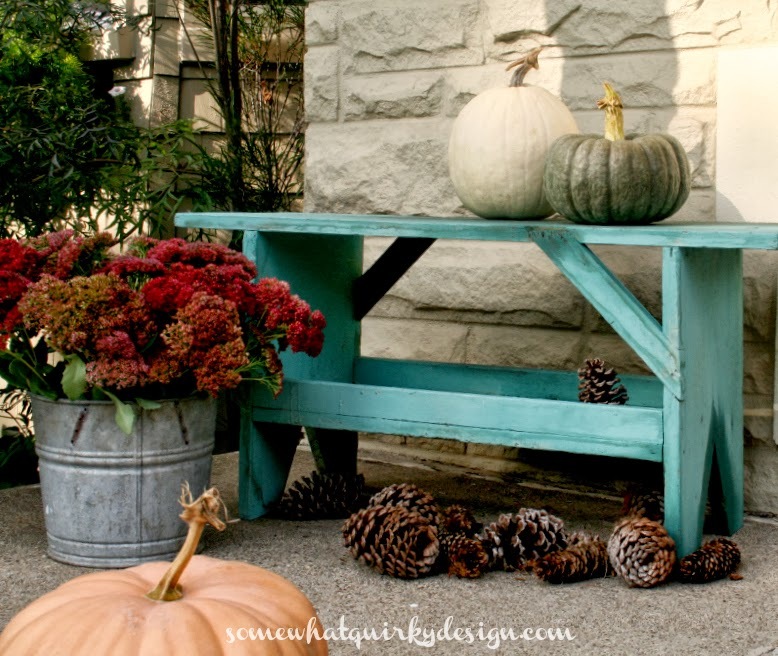 Lovely porch, definite yes to the painted runner. Can't help with the pumpkin dilemma, the UK is virtually a pumpkin free zone (ok slight exaggeration, but I've only seen orange ones in supermarkets). It looks great. My question is how old is your house? If it's new or a run-of-the mill-ish old house, I'd say go for it. If it's an old house that's uniques, I'd be careful about painting. 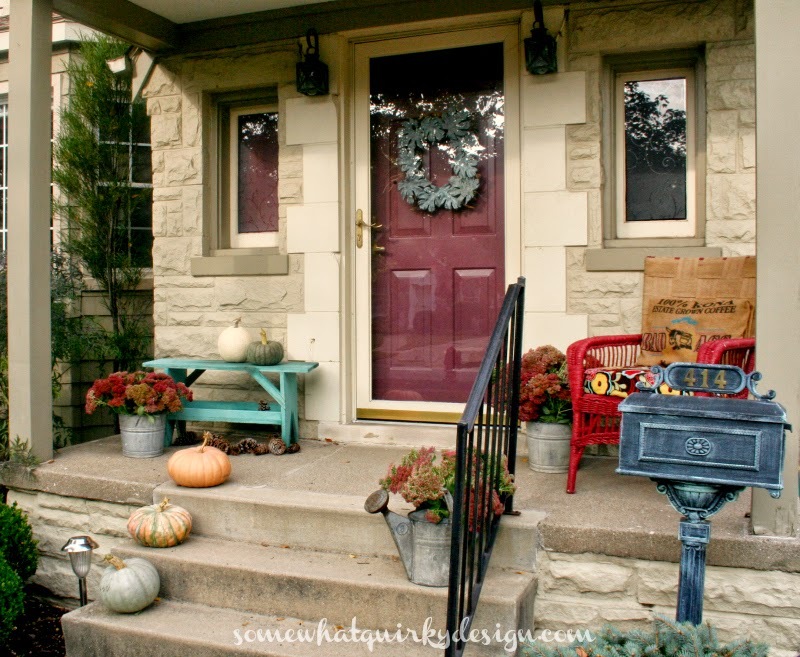 I do not think your porch is ugly. I would kill for your porch! And..I would paint on the steps. I've seen tons of cute stuff done on steps. Also...yes, you can eat those pumpkins. In fact, the blue one makes a better pie than the regular orange ones..very deep in flavor!! I love how you decorated your porch. Don't know about the pumpkin question. However, the porch, in my opinion, kind of "floats" because the stone and the concrete are very similar in color. 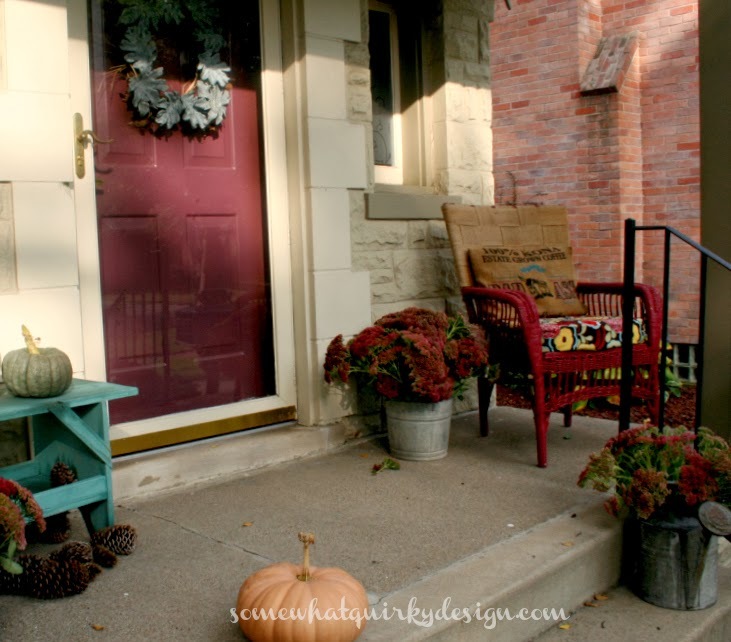 Maybe consider painting the porch and the steps a darker color that will ground it. A shade or two darker than the post color. Just an idea. :) Great bench! I love your problems. Have you seen the film Notting Hill? Hugh Grant's roomie would definitely poke fun at your problems. I think a painted runner would look nice. My back porch needs HELP. For now I put a rug on it, but I know I'm not fooling anyone.